I wait all year for July when luscious firm glossy dark-skinned eggplants start appearing in the local farmer’s markets. I see them piled in wicker baskets, and their tender freshness brings me to my first summer with Agastya and his paternal grandmother, Lakshmi. My South Indian mother-in-law had just flown in from Visakhapatnam to spend the summer with us in Hoboken, and she arrived just as the summer heat began filling the farmers market with delicious produce. I soon discovered that my mother-in-law was an expert with eggplant. 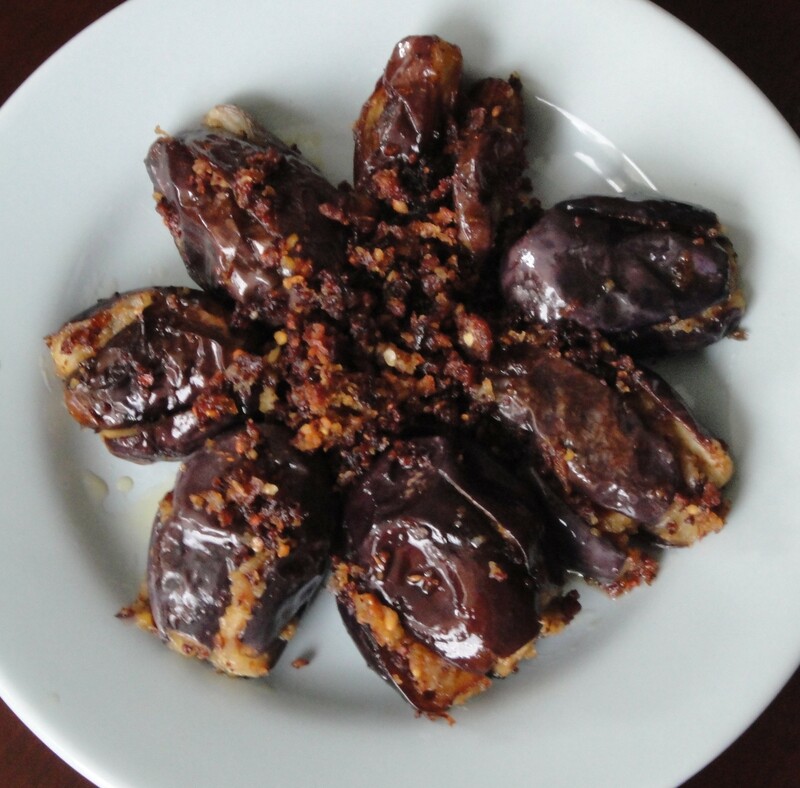 She made them in several ways: tiny eggplant stuffed with a spiced onion paste and pan-fried, sliced Asian or Italian eggplant with a ginger-onion-coriander paste and small eggplant halves simmered in a Hyderabadi peanut sauce. “Not again,” my good-natured mother-in-law would chuckle, eyes twinkling behind her glasses, as she noted the bags of eggplant that I had dragged in from the market. 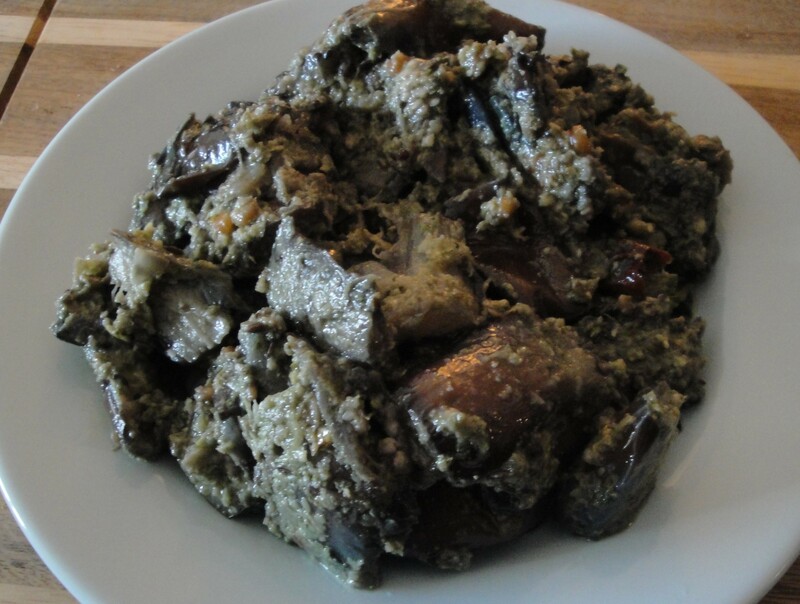 But she would proceed to make the most tasty eggplant dishes that I, of North Indian origin and raised on standard baigan bhurta, or roasted and mashed eggplant, had ever tasted. On Tuesdays, I would put my tiny, gurgling infant facing outward into a baby carrier and bring him to select vegetables at the market. Four-month old Agastya loved the noises and hues of the Hoboken Farmers market, and would grow bright-eyed with happiness when passers-by greeted him. I’d look at him, and wonder, are we all naturally just meant to be so happy and so social? I would point out bright red peppers, yellow ears of corn and green zucchini, never quite sure that he was listening. Now, two years later, when he points out the vegetables to me in the market, his still-small hand sturdily holding mine, I am convinced that he was. Agastya’s presence felt as if I had come full circle, for as a child I often accompanied my mother to the wet markets in Calcutta, first Dhangar Bazaar and later Jaddu Bazaar. Mummy took pride in selecting the best produce at the best prices for our home and would haggle with the vest-and-lungi clad vendors who sat atop their empires of glistening green, clicking her tongue in frequent annoyance. Overhead, the high crumbling exposed brick ceiling was hung with blue and green tarpaulin sheets, to protect the vendors from the gaping holes in the roof during the rains that frequently assailed Calcutta. I loved the moistness under my feet, the warren-like paths that crisscrossed the market and the overall tent-like atmosphere that seemed to hail from antiquity. I was wary, however, of scurrying roaches and rats, and would jump with nervous excitement when I spotted one. Later, after many years away in the U.S., I grew to understand this was a way in which I had sought time with my mother, who was otherwise occupied in the distractions of a busy household. The bustling market fostered an easy companionship between us. At home, I was often shooed away from the kitchens, but at the market I was allowed to observe and learn and participate. Like a worthy apprentice learning a trade.